The following bulletin was obtained from the public website of the American Bar Association. Through a combination of FBI and private sector analysis, it is likely the actors involved with this activity are located in Iran. At least some victim information from this cyber activity transits US-based infrastructure to IP addresses located in Iran. 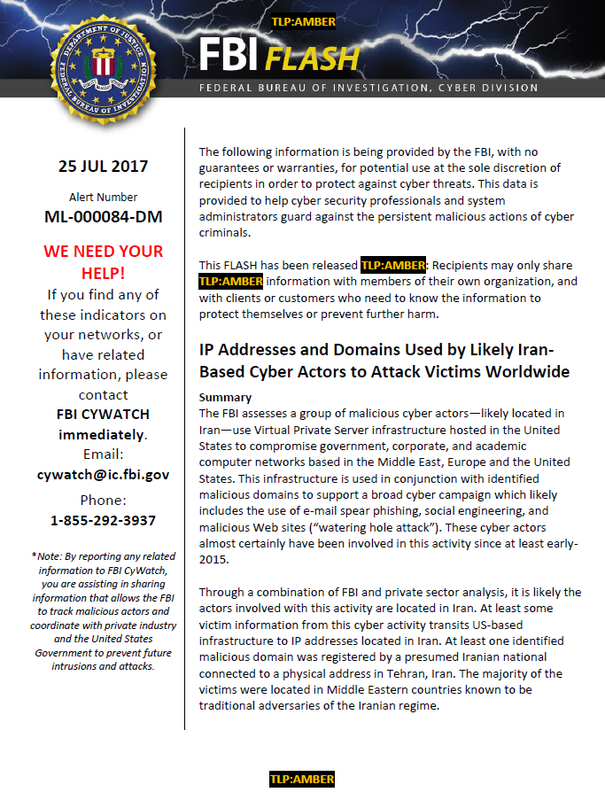 At least one identified malicious domain was registered by a presumed Iranian national connected to a physical address in Tehran, Iran. The majority of the victims were located in Middle Eastern countries known to be traditional adversaries of the Iranian regime. Attached to this FLASH is a list of 87 IP addresses and 136 domain names associated with this cyber activity. Activity related to these IPs and domains detected on a network should be considered an indication of compromise requiring mitigation.